I’d like to thank the Vintage Reviewer for allowing me to review on his site once again! COMIC REVIEW: We are back with “Smallville Season Eleven- Volume Two: Detective,” which is written by Brian Q. Miller (Batgirl , Earthward) and penciled by Chris Cross (Blood Syndicate, Firestorm), Jamal Igle (Arrow Vol. 1, Superboy Vol. 5: Paradox), Kevin West (Guardians of the Galaxy Vol. 1, A Nightmare on Elm Street), and Axel Gimenez (Injustice: Gods Among Us, Action Comics). When Bruce Wayne aka Batman gets a lead on where the man who killed his parents is, he is sent to Metropolis for further investigation. His tactics on finding the murderer may be too destructive, however, as Superman intervenes. This comic series of “Smallville” seems to be in its sophomore slump with this next graphic novel. With a key player such as Batman, you would think that this would make for a great read, but in fact it isn’t that good. Why? For starters, this feels like more of a coincidental, happy-go-lucky meeting of the two titular characters than something grand. Bruce Wayne needs to interrogate someone, Superman won’t let him, things get messy, and then they begin to see that there is a bigger picture to this. Don’t get me wrong, there were moments in this plot that I liked, but overall it was mediocre. Many things felt crammed in for the sake of it, especially the villains. I won’t spoil who shows up, but they were randomly thrown in for no apparent reason. To be honest, this is one of those stories that is a detour of the main arc, that being Lex Luthor’s evil plan. 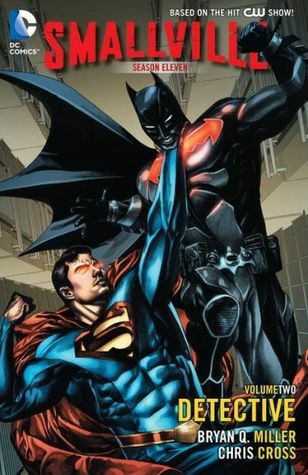 It wasn’t showcased in this novel whatsoever, and Batman and Superman’s conflict felt like a short confrontation to excite fans. The thing is, I wasn’t really excited. I’ve already seen them face off in this year’s “Batman v. Superman” (which was awful, by the way), so I wasn’t clamoring for another deadly meeting. Still, their chemistry was pretty good, and Miller knows how to make things interesting, even when working with such a hollow plot. Taking a step back and looking at the whole novel, however, I can definitely tell that Miller found trouble in ending this short story, for the first half was better than the second. Moving on, let’s look at the characters. This time around, everyone seems to be shifting into new forms. Not necessarily physical, but how they act. Everyone is learning new things, and new discoveries are to be found in this novel. One thing that has changed in a peculiar way is Lex Luthor. The man is turning into a much different person than in the show. He is a little nicer, jokes around a lot, and constantly talks to himself (technically it’s Tess, but you know what I mean). I don’t know what to think of this new Luthor. I smile at the jokes, but I don’t know if this is how he should act. I will admit that he is the most interesting pawn on this shallow board though. His issues with Tess are well-written and I am eager to see what happens next with him. As for the other characters, no one has moved forward. Sure, things are discovered, but it’s more for the readers sake than the characters in the novel. This plot is essentially one of those filler episodes of a season where the writers take a break from the main story just so they can meet the episode count of their season. Being as how this is a comic series, this shouldn’t happen. Finally, we get to the artwork, which is pretty bland. The art seemed to be my only big problem with the last graphic novel, and those feelings continue with this one. As you can see, I listed four pencilers above, all of whom worked on the art for the individual comics that make up this graphic novel. What half of them share in common, coincidentally, is they aren’t that good. The artwork in this was pretty bad, in different aspects. Chris Cross (nice name) found trouble in organizing his work. Even though his drawings of characters weren’t too shabby (they had the likeness of the actors, which was good), his boxes that made up the pages were jumbled and confusing to follow, making it hard for me to concentrate on the story. Plus, some of his characters would all of a sudden have the eyes of a cartoon cat, making it hilariously bad. Kevin West had to be the worst, as his characters looked like mannequins most of the time, showing very little in the face. Axel Gimenez was fine, even though his characters didn’t show much likeness to the actors, and Jamal Ingle was actually good in his work, save for Superman at times, who had the neck of a giraffe. This comic series has a hard time picking great artists, and I hope that the next novel improves upon this. In the end, I thought that this novel was rather flat, especially when compared to the first. It was a nice detour to the main story arc, but it wasn’t needed, and they could’ve done a better job at introducing Batman to the universe. Let’s hope the next graphic novel isn’t so much of a throwaway. COMIC REVIEW: “Smallville Season Eleven- Volume One: Guardian” is written by Brian Q. Miller (Batgirl , Eartward) and is drawn by Pere Pérez (Savage Tales, Adventure Comics Special). Not long after the battle against Apocalypse that ended season ten, Clark Kent aka Superman is dealt with a new task when Lex Luthor initiates a space-based system used to stop other-worldly threats from attacking earth, known as the Guardian Defense Platform. I wanted to thank Vintage Bullet for allowing me to review on this site once again. It was on my own accord to do so since I wanted to voice my opinion on the graphic novel series that is “Smallville Season Eleven,” being that my own site, Juicy Reviews, only analyzes films. Anyway, let’s get onto the review. Before I knew about this comic book series, I watched the television show “Smallville.” Although I picked up on the series a year after the show concluded in 2011, I was intrigued by the universe it created, with its many interesting stories and fun cast to watch onscreen. I adored the show, and when I found out that a comic series was published shortly after the TV show’s conclusion, I knew I had to get it. Granted, this is a graphic novel rather than the single comics themselves, but I prefer it this way nonetheless. I didn’t know what to expect out of this graphic novel. I haven’t read many comic books myself, but knowing that a writer from the television series was the head honcho of this comic eased my worries. Off the bat, I will say that this is a fantastic read. Not only are the characters and their personalities retained, but a fresh story has been formulated as well. Starting this comic felt like “Smallville” was never gone, and it brought me joy to keep up with these characters once again. The dialogue amongst our figures was written so well, and I found myself visualizing the lines as if they were said by the actors who played the actors who played them. If there is one thing to say about this novel, it’s that it doesn’t diminish the characters “Smallville” fans spent ten years with. Their conflicts and story arcs are interwoven masterfully, as there was no weak link out of the bunch. Everyone had their fair share of interesting moments and they all pushed the plot line further. As for the story itself, it was really good. I didn’t know how they would continue Clark’s adventures as Superman, being as how he has already fought many of his main villains in the TV show, but Miller found a way to bring Lex forth and further his struggle with Superman, offering a diabolical plot that I would like to see continue. There are many twists in this story, some small and some big. All of them caught me off guard and made it less predictable. Of course, the novel ends on a cliffhanger in an attempt to get the reader to buy more (which I am), but I find those endings to be great as they keep my grasp on the storyline and leave me begging for more. If there was anything that I could say badly about this graphic novel, it would be the artwork. Don’t get me wrong, most of it is good. There are just times, however, where it is ugly or cheap. Although the whole graphic novel is drawn by one person, he finds trouble in making characters like Clark Kent look the same throughout. Sometimes he will look like the actor Tom Welling from the show, and others he will look like a creepy man-child. It isn’t too bad to the point where I can’t read the book, but it is notable. In the end, I found this to be a great revamping of the television show as well as a fantastic launching point into the Superman mythos. I can’t wait until I receive to second novel, which includes Batman (that should be interesting).